Whether you're traveling to Washington or are moving to a new city, knowing the state and local taxes will help you budget your shopping trips. Washington State’s retail sales tax is 6.5 percent, but individual cities add on additional percentages. Washington is one of only nine states without a state income tax, and because retail sales tax is the states principal tax income source, the sales tax is higher than many other states. What you pay when you make a purchase is a combined rate—you will pay the state 6.5 percent plus the local rate for the city in which you make a purchase, plus any applicable Regional Transit Authority (RTA) tax. There are some exemptions to retail sales tax. Most grocery items, newspapers, and prescription drugs are exempt from sales tax, but junk food, prepared food, dietary supplements, and soft drinks are taxable. After June 1, 2012, hard alcohol sales moved from state-owned stores to grocery stores, and with the privatization of alcohol sales came an additional sales tax. If you buy alcohol that is more than 24 percent alcohol by volume, you will pay an additional 20.5 sales tax as well as the regular sales tax. As of summer 2012, some stores write the total cost of price tags while others only put the cost before tax. Some people are exempt from Washington retail sales tax. These include residents from Alaska, Colorado, Delaware, Montana, New Hampshire, Oregon, and American Samoa, as well as Alberta, Northwest Territory, Nunavut and Yukon Territory in Canada. Many sales to tribal members in Washington State are also exempt if the sale takes place in Indian Country. Since Washington shares a border with Oregon, which is a sales-tax-free state, some interesting questions about how and when Washington State residents must pay sales tax can come up. Although you can avoid tax on clothing or small home goods, large investment purchases like cars or mobile homes are subject to Washington state sales tax if you bring them back to register them in the state. Since Washington is also home to several Internet-based companies, how and when do customers pay online sales tax is also a common question. Many Washington-based online companies (including Amazon) will charge sales tax to state residents by looking at your shipping address. City sales tax rates vary across the state of Washington, but King and Pierce's counties cover most of the state's commercial regions. 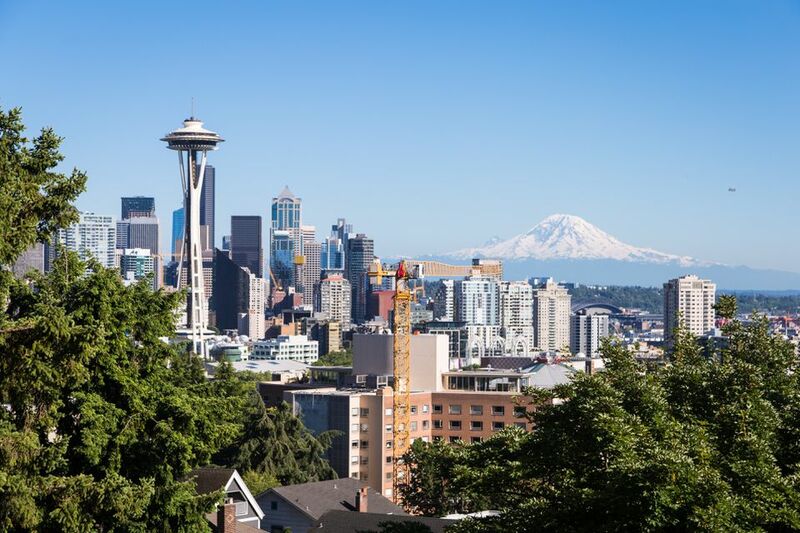 In Kings County, Seattle has the highest city tax at 10.1 percent, but 10 percent cities include Algona, Auburn, Bellevue, Burien, Clyde Hill, Des Moines, Federal Way, Hunts Point, Issaquah, Kenmore, Kent, Kirkland, Lake Forest Park, Medina, Mercer Island, Milton, Newcastle, Normandy Park, Pacific Kings, Redmond, Renton, Sammamish, Shoreline, Tukwila, Woodinville, and Yarrow Point. North Bend is the only city sales tax in Kings County at 8.9 percent, but cities with 8.6 percent city sales taxes include Black Diamond, Carnation, Covington, Duvall, Maple Valley, Skykomish, Snoqualmie, but Enumclaw is at 8.7 percent. In Pierce County, city sales taxes are significantly lower, but Tacoma has the highest at 10.1 percent. City sales taxes of 9.9 percent apply in Auburn, Edgewood, Fife, Fircrest, Lakewood, Milton, Pacific, Puyallup, Ruston, Steilacoom, and University Place. City sales taxes of 9.3 percent apply in Bonney Lake, DuPont, Orting, and Sumner. City sales taxes of 8.5 percent apply in Gig Harbor while 8 percent applies in Roy. The lowest city sales taxes in the state at 7.9 percent apply to Buckley, Carbonado, Eatonville, South Prairie, and Wilkeson.